Built in antivirus and anti spyware software. 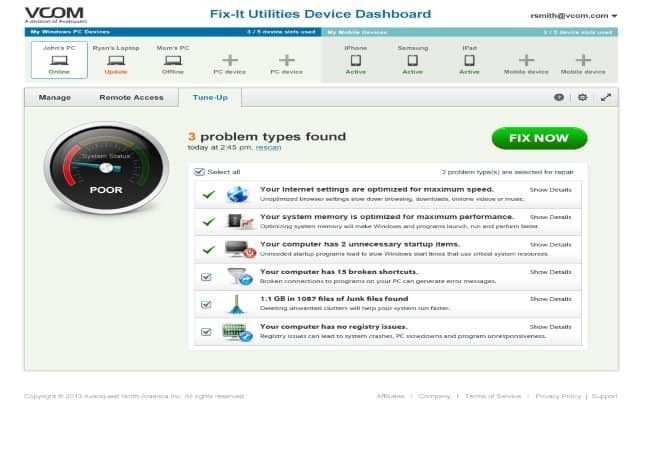 Fix-It Utilities 15 Professional from Avanquest Software helps to keep your PC operating smoothly by using it to scan, identify, clean and repair errors in your Windows registry with a single click., with the new features set and enhancement make it one of our best PC and system repair software in the market on 2013, such features as One-Click Performance and Security Wizards are the answer to your regular PC needs. Dramatically boost software performance in your PC by running multiple optimization and repair tools at once. Choose from the Optimize, CleanUp, FixUp and Security Wizards or run the Comprehensive Wizard to take care of everything automatically. With the new Lightning Fast Disk Def-rag Engine optimizes your file system and consolidates free space. Our new comprehensive and fast Disk Defragmentation engine comes with three levels of sophistication including boot time optimization. And with PC Startup & Shutdown Analyzer which monitor and manage which software cause startup or shutdown delays. Identify how much CPU time, memory and disk operations take place during startup and shutdown giving you true insight to what is happening on your PC during startup and shutdown. Malicious Link Identifier Search, shop and social network knowing that you, your identity, and personal information are safe. Checks each web page in real time before it opens on your computer and automatically updates whenever a new threat is discovered. 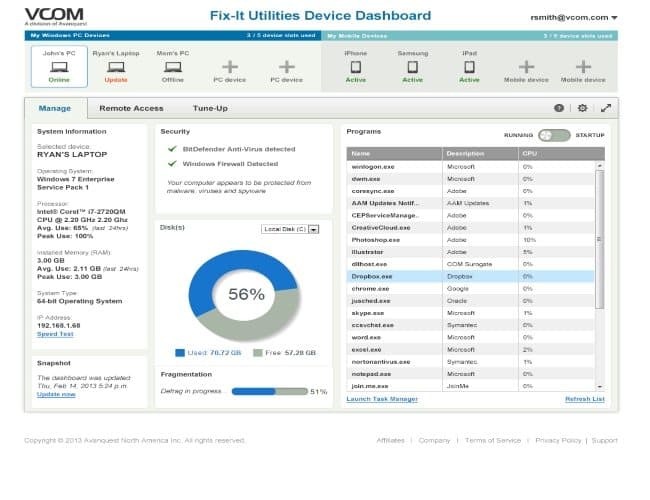 Avanquest Fix-It Utilities 15 Professional, like other PC tune-up utilities, gives you the option to make backups of your drive so that you can retrieve documents, photos, and other files at a later date, should you delete them or experience drive failure. You can also create a Rescue CD that will let you boot the PC should a problem occur. Avanquest Fix-It Utilities 14 Professional also contains a file shredder that meets the U.S. Department of Defense Security cleaning standards. Fix-It Utilities 15 Professional also includes optional antivirus and antispyware protection that comes with 1 year of free updates. The Internet Speed Optimizer offered barely no change when I am loading a Flickr page, and later downloading a large file. Other important feature is Credit Card Transaction Security, You can make online transactions safely and securely by encrypting credit card data. Spyware use a keylogger to capture and record the keystrokes you enter on your keyboard. They can steal your identity, know your website passwords, record and then use your credit card information to make purchases illegally. 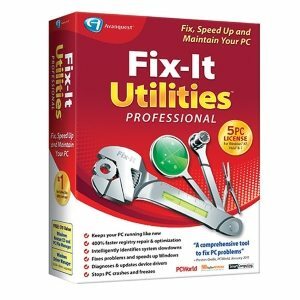 Overall, Fix-It Utilities 15 Professional offers a great many features and in-depth repair solutions for both software and hardware problems. 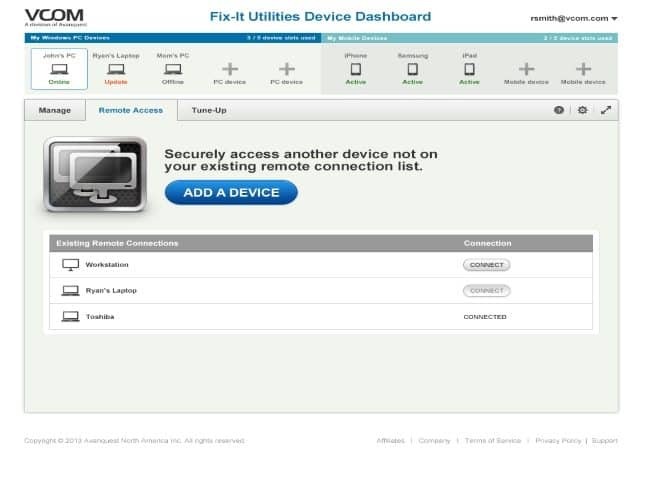 Remote access, and Mobile Locator While the price of $39.95 which consider cheap comparing to other PC Repair and Tuneup tools, a customer is getting a great deal of functionality in the program. How To Fix Xinput1_3.dll is Missing or Not Found Error?